Last night we showed 3 previews of Embodied at the GPO. All performance starting today are SOLD OUT! Crazy! Thanks to everyone for the support. Here I am having a little rave to myself in Fógraím / I Proclaim. I had the pleasure of performing as part of Centenary on RTÉ on Easter Monday. The show was beautifully choreographed by David Bolger, directed by John Comiskey and starring many talented singers, dancers and actors. 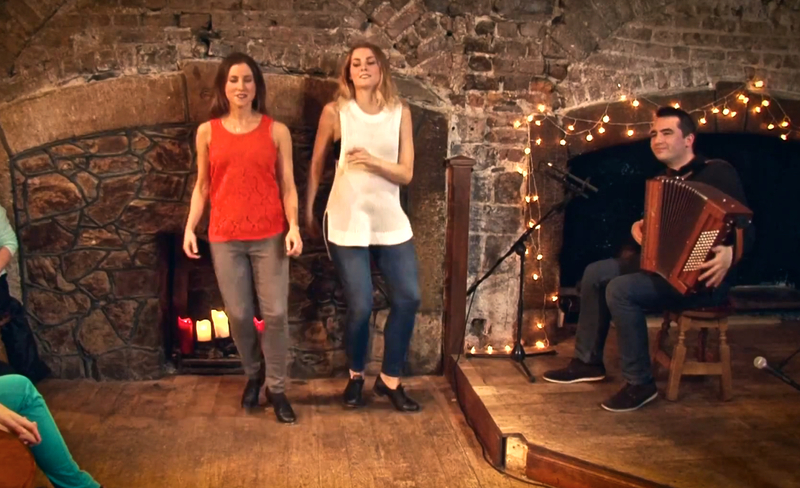 I danced some sean-nós steps with friends Emma O’Sullivan, Samantha Harvey and Eamonn Moloney with music by the fabulous Sharon Shannon, Dónal Lunny, Michael McGoldrick and John Sheahan. Well worth the watch.. hard to hold back the tears at times. Watch Centenary here: http://www.rte.ie/player/ie/show/centenary-30003958/10552342/. Free sean-nós taster class, 6 Jan 2016! Athbhliain faoi mhaise a chairde, tá súil agam go raibh Nollaig mhór mhaith agaibh! If you’ve made a resolution to learn sean-nós dance in 2016 then come along to my free taster class in DanceHouse on Wednesday, 6 January 2016 from 7-8 http://www.danceireland.ie/events/free-taster-classes. Free beginners taster class, 7-8, DanceHouse, Foley St, Dublin 1 (located beside Talbot St). I’m so excited to be planning a dancing trip to New York City at the end of June and start of July where I’ll be teaching sean-nós dance masterclasses. Stay tuned for details! Athbhliain faoi mhaise, chairde! I hope you had a wonderful Christmas and are ready to get back into the studio to dance your socks off! I’ll be running two sean-nós dance classes on Tuesdays and Thursdays. 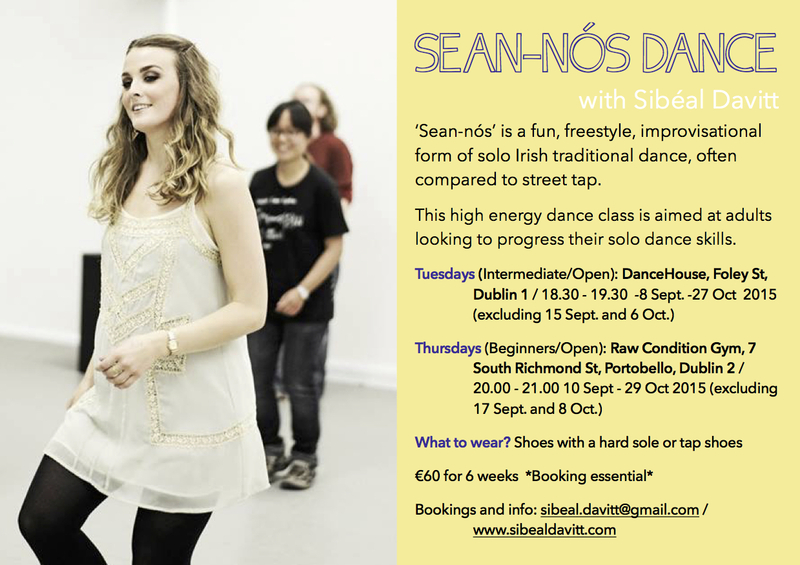 The full schedule can be found over on https://sibealdavitt.com/dance-classes/. If you’ve been curious about sean-nós dance for a while then this is the perfect opportunity to give it a try. It’s a New Years resolution that’s bound to last! Here’s a clip of my performance at Electric Picnic last summer for a bit of a taster. Myself and Mary Beth Taylor are hosting a special sean-nós dance event at Club Chonradh na Gaeilge on Thursday 11 December 2014. The evening will kick off at 7.45 with a free sean-nós dance workshop at open level followed by live music and dance. The floor is open to all dancers from beginners to improvers as well as other professional dancers. Events of this kind are very rare in Dublin and we hope to have a full house of musicians, dancers and onlookers with a warm Christmassy vibe. It will be a perfect opportunity to learn a few new steps, share what you already know, meet other dancers based in Dublin or just to sit back and soak up the atmosphere. Feel free to join the event on Facebook and spread the word https://www.facebook.com/events/372104376303249/. RSVP on Facebook or e-mail sibeal.davitt@gmail.com. Big thank you to @girlcrewapp for inviting me to speak at their event on Saturday! Míle buíochas le @jcidublin as an ngradam!